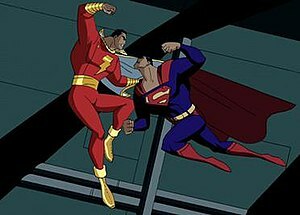 Captain Marvel: Shazam, does he have a problem! This is another in my series taking about superhero characters. In my kickoff post I explained how in some ways they are the modern Gods – created in our image to put into stories to help us understand ourselves better. This time I’m looking at Captain Marvel, a small boy who at a single world can become the World’s Mightiest Mortal. Young, homeless newsboy Billy Batson is taken before an ancient wizard, Shazam, where he is given a magic power. By speaking the wizard’s name aloud, he is gifted with the power of the gods contained therein: the wisdom of Solomon; the strength of Hercules; the stamina of Atlas, the power of Zeus, the courage of Achilles, and the speed of Mercury. In a flash of lightning he is transformed from a small boy to a towering figure in red and gold, a defender of justice nearly on par with Superman in sheer power, but with a child’s heart inside. It took me a long time to understand Captain Marvel, but in hindsight it should have been obvious: Marvel is the embodiment of the terrifying transformation we go through from child to adult. Billy Batson is about as frail as you can get – he has no parents, no home, struggling in the world. He has a child’s innocence and isn’t bitter about his situation, but doesn’t have a clear way out. Suddenly a change is thrust upon him, and he has enormous power he doesn’t quite know how to handle. Situations are much more complex than he is used to, and he has the ability to cause horrendous damage. He is suddenly responsible for the fate of the world. There’s a moment in I think everyone’s life where we realize that there is no instruction book to things, and all the adults we’ve looked up to have really been faking it all along. Now we have to start faking it, too. We can see the relative ease of childhood receding behind us, and the unyielding responsibility of adulthood bearing down. We’re kids in adult bodies, and not entirely sure we know how to handle them. This is eternally the state in which Captain Marvel lives, at a crossroads he can never move past. I think it took me so long to “get” Marvel as a character because he is very narrow. Is he an adult? A child? Both? His secret identity is too young to face the life complexities of Clark Kent or Peter Parker, and his alter-ego is so mighty as to have the same issues as Superman in facing a real challenge. His essence isn’t in one identity or the other, but the combination of the two. Off the top of my head, he may be unique in this regard. It makes him very interesting in one respect, but very niche in another. Perhaps this is why in spite of his catch phrase being fairly well known, Captain Marvel himself has never enjoyed the same popularity as other comic heroes. Good characters need to be clearly defined, and have some depth. While Marvel has the former, he is sorely missing the latter. Being trapped as the most powerful metaphor for puberty ever just isn’t a strong road to immortality.